We continue to monitor the situation on the island of Big Island, where the volcano Kilauea is erupting. I would like to tell you that the situation is getting better, but it only gets worse. Observatory of Hawaiian volcanoes warns of the possibility of an explosive eruption, which is completely uncharacteristic for Kilauea volcano. The staff of the observatory told what is going on under the ground. Earlier we reported on volcanic cracks, from which lava flows. They reached the residential areas. Also, difficulties are caused to the inhabitants of Big Island by clouds of sulfur dioxide. However, it is now clear that the crater of the Kilauea summit has undergone deformation, which leads to a different behavior of the volcano. The lake, overflowing with lava, fell by almost 300 meters. This is followed by a chain of possible events leading to an explosion. Explosions are peculiar to stratovolcanoes, to which Kilauea is not. Stratovulcans throw out rocks and ash. In the case of Kilauea, the same thing can happen, but absolutely different processes will lie at the root of this explosion. Scientists believe that the cause of the explosion will be steam. 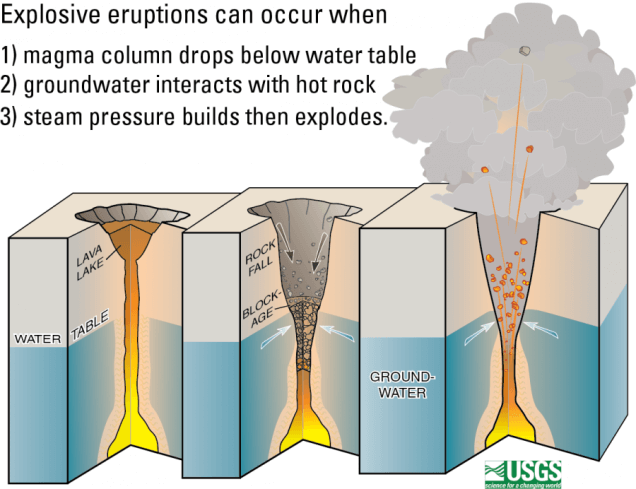 If the falling lava lake is supplied through a narrow passage by a much larger magma chamber, then ultimately the level of lava will fall below groundwater. When this happens, the water can flow and turn into steam heated from below. In the best case, this steam will simply go up, but there is reason to believe that the same passage is unstable, and can turn out to be sealed pieces of rocks. In this case, the pressure will increase and steam will throw pieces of rocks together with ash into the air. All these are not empty guesses and assumptions. Exactly in the same scenario events developed in May 1924 in the case of the same volcano Kilauea. For two weeks, the volcano threw rocks into the air in a series of explosions. Scientists believe that falling rocks at this time will not harm the inhabited area, but ash can cause respiratory problems. Alas, no one can say exactly what will happen and when. Predicting the behavior of the volcano is very difficult.